Times indicated below are start/show times. If further information is required, please contact Gig Manager Glen. 1) Saturday, February 17, 2018: Rexdale Presbyterian Church - Highway Terrace Seniors, 2314 Islington Ave., Etobicoke, Ontario M9W 5W9. Valentine's Day celebration. Time: 7 PM to 7:50 PM, and 8:15 PM to 9:00 PM. Two sets with a break. Parking: Parking at the rear of the hydro substation; the first driveway south of the church. Directions: Just north of the Hwy. 401 on the west side of Islington Ave. [See their website]. 2) Thursday, April 26 through Saturday, April 28, 2018: North American International Banjo Convention, Dearborn, Michigan, at the Double Tree Hotel. 3) Saturday, June 9, 2018: The Yonge-Lawrence Village BIA, Village Day. At our old spot at the Scotiabank, 3169 Yonge Street, Toronto, Ontario, M4N 2K9. Back to Summer Uniforms starting with this gig. Time: 10:00 a.m. to 2:00 p.m. Performance: 3 sets of 45 minutes each. Parking: Yonge St. or side streets. Directions: On the east side of Yonge Street, two and a half blocks north of Lawrence Avenue East. [See their website]. 4) Thursday, June 14, 2018: Park Place (Chartwell) Retirement Residence. 15055 Yonge Street, Aurora, Ontario, L4G 6T4. Time: 2:30 pm to 3:30 pm (or a bit longer if requested). Parking: Parking is quite limited. Bandmembers should seek parking on the local side streets or on the west side of Yonge Street (the far side of Yonge Street from the residence). Equipment dropoff can be effected at the front door, but then parking sought off-site as above. Directions: Traveling north on Hwy. 404, take the Bloomington Road (# 40) exit. Turn left and travel west on Bloomington Road for 5.70 km. to Yonge St. Turn right and travel north on Yonge St. for 3.60 km to Park Place. [See their website]. 5) Thursday, June 28, 2018: Woodhall Park Retirement Village, north building basement, 10260 Kennedy Road North, Brampton, L6Z 4N7. Time: 2:00 pm, one set for one hour. Parking: There are two buildings on the site, with the main entrance driveway midway between the two buildings. The assisted living building where we will perform is the building on your right or on the North Side of the site. Turn right for the preferred parking and front entrance, alternately you can conveniently park anywhere on the lot by either building. The building to the south is the retirement home. Overflow parking, if unexpectedly necessary, would be at the church directly across Kennedy Road. Directions: From either Hwy. 401 east or west, take Hwy 410 north to Brampton. From either direction, ensure that you are in the collector lanes to access Hwy 410. Travel north on Hwy 410 for 13 km to the Bovaird Drive exit. Take the exit and turn left heading west on Bovaird Dr. for 1.4 km. Turn right on Kennedy Road North and travel north 0.6 km. Woodhall Park ALC will be on your left. There should be plenty of parking in the complex comprised of two buildings. [See their website]. 6) Wednesday, July 11 through Saturday, July 14, 2018: All Frets 2018 Convention, Buffalo, NY, at the Millennium Hotel. 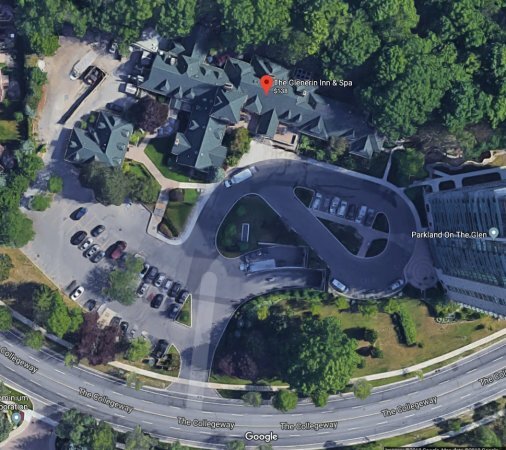 7) Wednesday, September 12, 2018: Credit River Retirement Residence, 175 Rutledge Rd., Streetsville, Ontario, L5M 0X7. An Afternoon Entertainment. Parking: Parking is at the front of building but seems to be a premium. Glen believes you can also park on the street prior to reaching the parking area in front of the building. Note that Google Earth does not have a street view for this location since it's only been open for a year. Directions: Taking Hwy. 401 from either east or west, exit at sign for Erin Mills Parkway and Mississauga Road in Mississauga. Turn left traveling south on Mississauga Road which automatically becomes Erin Mills Parkway south of Hwy. 401. Travel south on Erin Mills Parkway for 3.65 km to Britannia Road West. Turn left on Britannia Road west heading east for 0.9 km. to Joymar Dr. Turn right on Joymar Dr. and travel south for 0.9 km. to Tannery St. Turn left and travel one block. Turn left again into the Credit River Retirement complex. [See their website]. 8) Saturday, September 29, 2018: Markham Fair. At the fairgrounds in Markham,10801 McCowan Road, Markham, Ontario, L3P 3J3. In the Entertainment Tent on Horse Drive. Back to Winter Uniforms: Black pants, long sleeved TBB shirts, white tie, black shoes. Time: First set at 2:30 pm, second set at 4:00 pm. Parking: In the north-east parking lot by Main Entrance. Access parking lot by turning east off McCowan along the roadway that runs along the north side of fairgrounds. This large north-east parking lot is adjacent to the Main Entrance for fairgoers. Directions: Directions to the fairgrounds. [See their website]. We will be in the Entertainment Tent. [See their website]. 9) Wednesday, November 7, 2018: Christie Gardens Apartments and Care, 600 Melita Crescent, (east side of the complex is on Christie Street) Toronto, Ontario, M6G 3Z4. Afternoon entertainment. Parking: Park on the opposite side (east side) of Christie; take the south driveway (there are two parallel driveways) adjacent to the sunflowers painted on the retaining wall. The southern driveway leads to the huge Visitor Parking lot on the east side of Christie St. opposite the south end of the complex. For people with just their banjo, music and stand, they can park their car first, cross Christie St. and then enter at the security door at the bottom of the ramp. Directions: If you need driving directions, talk to Glen. 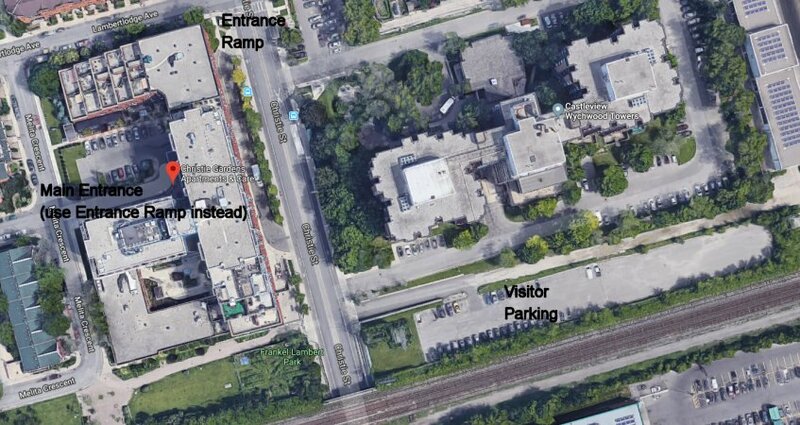 Once you get to Christie Gardens this is how Glen suggests to gain entrance to the auditorium: you enter the ramp at the north-east part of the complex from Christie St. right near Lambertlodge Ave. I do believe it is the basement floor as well. The ramp begins just a few feet south of Lamberlodge. Take the ramp to the bottom of it and you'll see doors on your right. That's the security guard location who should be aware of who we are when we arrive. This is the best entrance for taking equipment in because you're then on the right level for the auditorium where we perform. It's a big ziggy-zaggy to find the auditorium but the security guard can always direct you. As well, after you drop off your equipment inside the door, you can take the ramp back up and it re-enters Christie St. Immediately across the street to your left is where the sunflowers are on the wall. Enter the south driveway (there's two there) and on your right is the visitor parking. Warning: If you try to enter at the main entrance on the west side of the complex, it's on the second (and wrong) floor. Then you're into elevators which is not convenient at all. Also, parking at the main entrance for visitors is extremely limited. [See their website]. 10) Monday, December 10, 2018: Special Christmas Show. Details from President Glen Midgley. Time: 2:30 pm, one set for one hour. 1) Wednesday, January 16, 2019: Amica Newmarket Retirement Community, 275 Doak Lane, Newmarket, Ontario, L3Y 0A2. Parking: The parking area is on the south and east side of the the complex. Directions: Travelling north on Hwy. 404, take exit # 74; Mulock Dr./Vivian Rd. in Newmarket. At the end of the exit ramp, turn left travelling west on Mulock Dr. for .60 of a km. At the stoplight, turn right travelling north on Harry Walker Parkway South. Note that there is an ESSO station on your right as you turn to travel north. Travel north 1.15 km. to Gorham St. Turn left onto Gorham St. and travel west for 1.15 km. to Doak Lane which will be on your left. Turn left (there are stoplights at this intersection) on Doak Lane and as you immediately enter the complex, turn left into the parking area. [See their website]. 2) Saturday, April 13, 2019: Birthday Party Entertainment. At Glenerin Inn, 1695 The Collegeway, MIssissauga. Ontario, L5L 3S7. Party for Mr. Earl Fee. Time: 7:45 pm to 9:00 pm or so. End of show time may be extended by request. Parking: At Glenerin Inn parking lot. Directions: From either QEW East or West, take the Mississauga Road exit in Mississauga. Note that there are different exit ramps depending upon whether you're coming from the east or the west. But, in either case, at the end of the exit ramps, turn left onto Mississauga Rd travelling northwest for 5.2 km. Note that for the last 2 kilometres, the road is both windy and hilly. Just after you cross Dundas St. while still on Mississauga Road, turn left at the next stop light which is The Collegeway. Travel for just a few hundred metres and the Glenerin Inn will be on your right hand (north) side. From Hwy 401 either east or west, take the Erin Mills Parkway/Mississauga Road exit. Coming from the west, turn right travelling south on Erin Mills Parkway for 9.2 km. to The Collegeway. Coming from the east, turn left onto Erin Mills Parkway and travel the same distance to The Collegeway. Turn left onto The Collegeway and travel southeast for 1.3 km. The entrance to the Glenerin Inn will be on your left hand (north) side. [See their website]. Layout of the Glenerin Inn site. 3) Thursday, April 25, 26 and 27, 2019: North American International Banjo Convention, Dearborn, Michigan at the Double Tree Hotel. 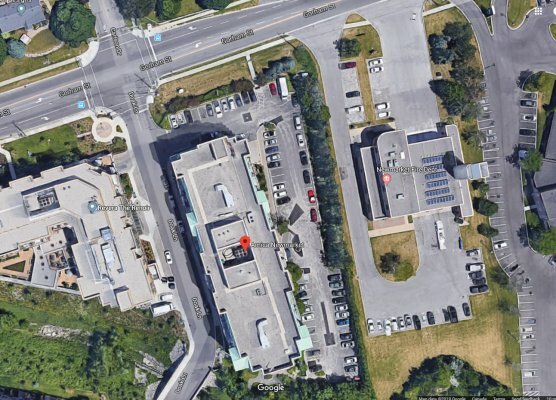 5) Monday, July 1, 2019: Amica Newmarket Retirement Community, 275 Doak Lane, Newmarket, Ontario, L3Y 0A2.